What can surpass the loveliness of this spectacular bird? Although the Cardinal is the State Bird of Virginia, it can be found in many other states as well. No matter where you travel in many areas of the United States, you can find at least one or two of these red-feathered birds in the trees. This vibrant needlepoint design was adapted from an image of a single Cardinal perched on a barren tree branch. 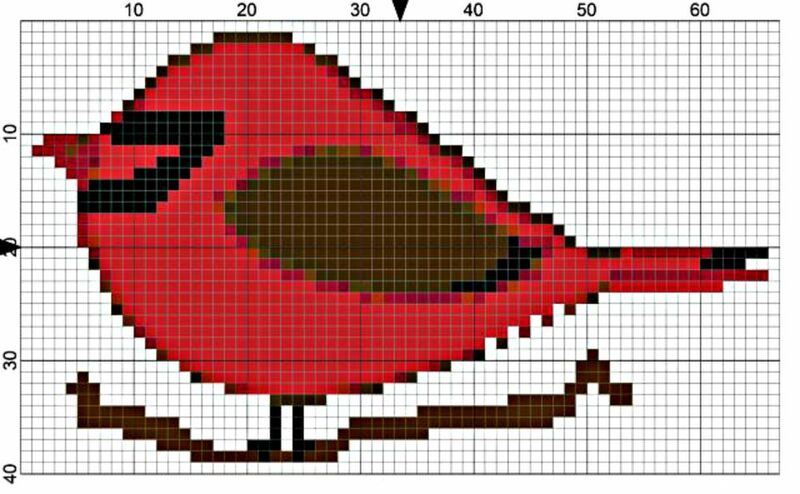 The uncomplicated 4.5-inch by 2.75-inch Cardinal needlepoint pattern is 65 stitches wide and 38 stitches high and can be completed in several evenings or over a weekend, if worked on #13 or #10-mesh single thread needlepoint canvas. If you can thread a tapestry needle and work basic tent needlepoint stitches, then you can successfully stitch this simple design. When deciding on thread choices, select monochromatic shades of red from medium to dark in stranded cotton or silk, and gently mix them to make the Cardinal look as if it is ready to take flight. Designed for stitchers of all levels, this project can be made with simple as well as some challenging stitch patterns. For example, basic needlepoint stitch techniques such as tent, reverse-continental and basketweave work well for the Cardinal motif as well as encroaching and slanted Gobelin stitches. Use chain, stem, split or more decorative needlepoint stitches for the tree branch. To add texture and definition to the bird’s feathers, consider working clusters of horizontal leaf stitch for the wing area and reverse-continental stitch for the rest of the bird. Warmer climates in the southernmost part of the USA boast an assortment of exotic birds with colorful tails and feathers. If you are crazy for stitching birds, you will love this project! The beautiful exotic needlepoint bird looks like the ones you might find in Florida or in the aviary of your local zoo. This is such a fun project because it is a quick stitch and can be finished into a variety of items for the home. Set aside an evening or two to stitch the 3.57-inch by 2.79-inch super easy exotic bird needlepoint design on 13-mesh or larger canvas. Choose lightweight crewel wool or textured specialty threads in bright colors to work the simple needlepoint design. Outline the shape of the bird with tent stitch and then use the encroaching Gobelin stitch throughout to smoothly blend the colors as seen on the needlepoint chart. When all stitching is done, brush the bird with a small suede renewal brush to create a fuzzy feather effect. Use #10 or #14-mesh plastic canvas to stitch a memory bookmark, refrigerator magnet or other keepsake with these fun needlepoint projects. Quickpoint or rug canvas with mesh sizes less than 10 stitches per inch could be used to make pillows and wall hangings as well. Think outside of the box and try using beads, sequins, charms and other findings to embellish the completed needlepoint birds--especially if the finished pieces will be turned into stand-up figures. If you plan to frame an embellished bird, make sure to use double or triple mats so that the findings will stand out properly. Do not use glass on the frame. Turn the completed needlepoint into small tree ornaments or soothing needlework mobiles for a baby’s room. They are sure to become favorite adornments for your tree, and your baby will be fascinated by the colored birds as they twirl above a crib. January 5th of every year is National Bird Day in the USA. Created by bird advocates, this unique holiday seeks to draw attention to the plight of birds held in captivity by raising public awareness and education of the important role that birds play in maintaining a healthy environment. These adorable needlepoint bird patterns can be used to celebrate the special occasion and help the cause. Simply stitch one or both of the easy projects and share with friends and other needlepointers what you have learned about each bird while stitching the designs.